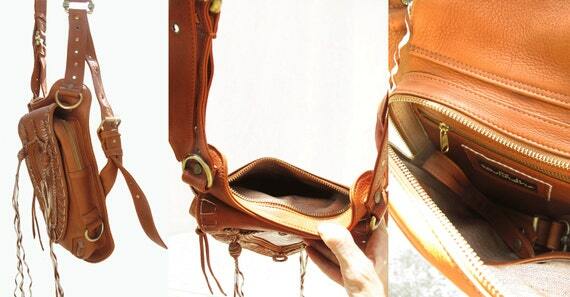 A little while before Christmas, I came across a pin on Pinterest’s popular page for a striking leather bag. It sang out at the bohemian in me, and dating a cowboy has given me a fresh appreciation for quality leather goods. I loved the style, and have been looking for a good handbag for a while. My days of buying a £40 “leather” bag from Aldo or Next are long gone – the bags available on the high street are too bland for my taste, and I prefer the strap across the body to something that needs to be tucked under my arm. There was just one problem with this bag. The colour. I wanted red. Not just any old red, I wanted scarlet (or “harlot scarlet” as I like to call it). I wanted brash, bright, attention-seeking red. Etsy being the kind of marketplace where you can make absurd requests like that, I went ahead and messaged the seller directly, to ask if a custom made bag in red was possible. Rawia was very prompt to reply, and very helpful. I could indeed have the harlot scarlet of my dreams, she would source some immediately and let me know what she could find in the ostrich leather for a contrasting colour on the top flap. The colour was to die for. The ostrich panel is a glorious burnt orange that looks superb against the outrageous red. The leather is thick and soft and will age beautifully with use. What I loved most was the craftsmanship. This bag is sturdy as anything. The seams are all secure and neat, there wasn’t a single thread out of place. 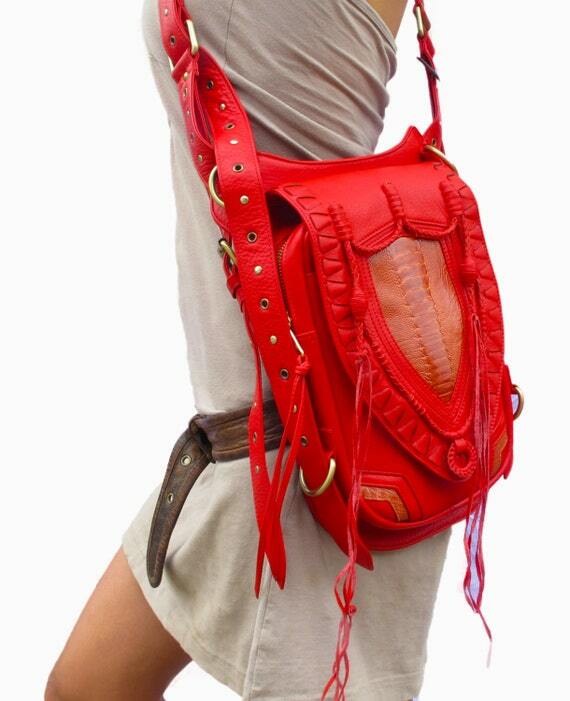 The bag is lined with canvas, and the inside pocket is finished off with a strip of red leather across the top edge. All of the hardware is high quality brass. Every rivet is perfectly lined up. The braiding on the front panel is tight, neat and strong. 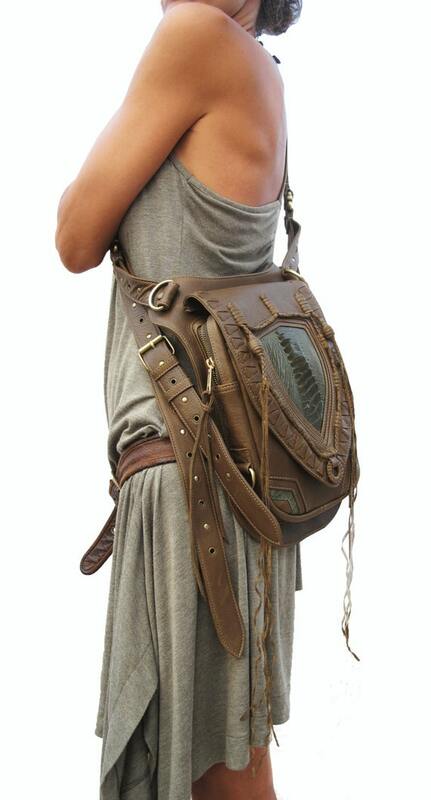 I could wear this bag all over the mountains on horseback and it would hold up wonderfully. It holds everything that I need: purse, keys, phone, excessive amount of lip balm, tissues, pens, paper, random receipts, gum… It comes with detachable straps that will hold a coat or jumper or blanket or whatever else you need to roll up and keep out of the way, as well as a strap to anchor the bag to your thigh. I wish I made more use of this strap, as I often find my bag around my head when I bend down in the supermarket. The shoulder strap is completely adjustable, and can be changed to wear around your waist like a holster, short on the shoulder, or long across the body. This bag has been designed and made with such care. The love of its maker pours out of it. Rawia’s other creations on her shop are similarly beautiful, and very high quality. She made my bag very quickly and it was shipped in good packaging to protect it on the long journey from Australia. I could not have been more delighted when I opened the parcel. Everywhere I go, I get compliments about it. I enjoy the smugness for a moment. Doing business with Rawia was a real pleasure. It’s refreshing to encounter people who trade on a more personal level, far from the corporate and bulk buying worlds of Amazon and eBay. This bag will last me for many years to come, and I have already made plans to use some of Rawia’s other creations as gifts for good friends in the future. Visit Rawia’s Etsy shop, Soulindha, and see what you find. She offers this design in several other, more neutral colours, as well as many other designs of bag. Well worth a look, and certainly worth the investment. ← On climbing back on.